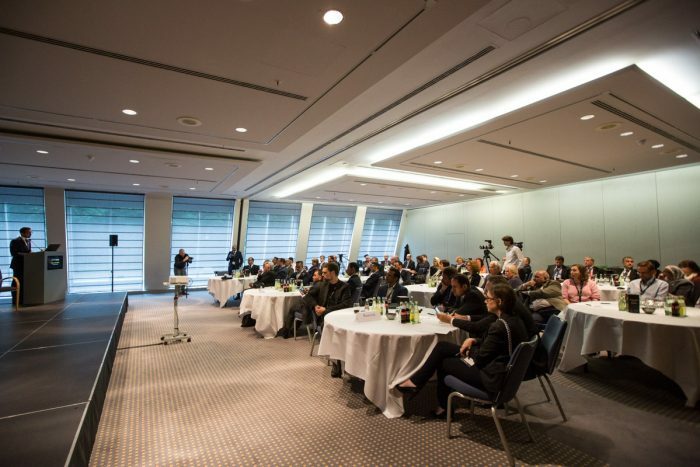 Promoting Sharjah’s array of investment opportunities to Germany’s business community was the basis of a recent visit to Berlin which was successfully concluded by the Sharjah Investment and Development Authority (Shurooq) on the day before yesterday (Friday). 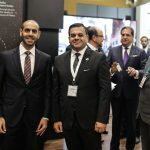 During their visit, Sharjah Investment and Development Authority (Shurooq) was at the German capital as it organised the Sharjah-Berlin Seminar, while on the second day, it participated at the 19th Arab-German Business Forum. A high-level delegation comprising of senior executives and CEOs from Sharjah’s government bodies and private sector corporations took part in the twin business events with the aim of introducing the emirate’s business-friendly environment and opportunities to German investors. The activity formed part of Sharjah’s ongoing efforts to promote and highlight its investment potential to international investors. 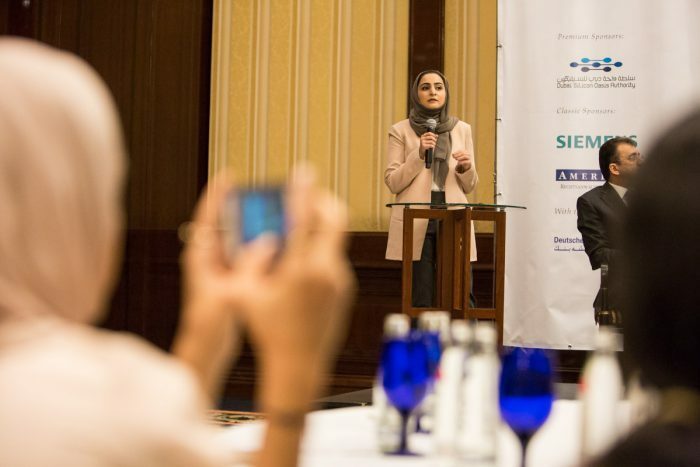 The Sharjah-Berlin Seminar, organised by Shurooq in association with the German – Arab Chamber of Industry and Commerce (AHK), the German-Arab Friendship Association (DAFG) and the Berlin Partner for Business and Technology, hosted the Sharjah delegation which was headed by H.E. Sheikh Fahim bin Sultan Al Qasimi, Chairman of the Department of Government Relations in Sharjah, which witnessed a high-level participation of H.E. Marwan bin Jassim Al Sarkal, CEO of Shurooq, H.E. Hussain Al Mahmoudi, CEO at AUS Enterprises, Fahad Ali Shehail, Chief Development Officer at Bee’ah, Sara Al Madani, Board Member of the Sharjah Chamber of Commerce and Industry (SCCI) and Mohammed Ahmed Amin, Assistant Director-General for Communication and Business at SCCI. Joining alongside the Sharjah delegation was H.E. Mohamed Salem Al Falahi, the second secretary and head of the department of student affairs at the U.A.E. Embassy in Berlin. Participating along the U.A.E. delegation also included Felix Neugart, CEO at AHK, Dr. Stefan Franzke, CEO at Berlin Partner for Business and Technology and Bjoern Hinrichs, Managing Director at the German-Arab Friendship Association (DAFG). 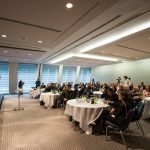 The one-day business seminar, which brought together more than 50 German investors and businesspersons, saw Sharjah’s delegates and the invited attendees reviewing ways that they could work together to strengthen their existing avenues of cooperation and partnership. 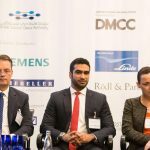 Among the issues under the spotlight were how to attract more German companies into Sharjah and how the emirate should be seen as not only a rewarding destination in its own right, but also as an influential entry gateway to the wider Gulf region. The seminar also included a panel discussion titled “Investment Opportunities in Sharjah”, hosting a series of panelists who were among the U.A.E. delegation and included H.E. Marwan Bin Jassim Al Sarkal, H.E. Hussain Al Mahmoudi and Fahad Ali Shehail. H.E. 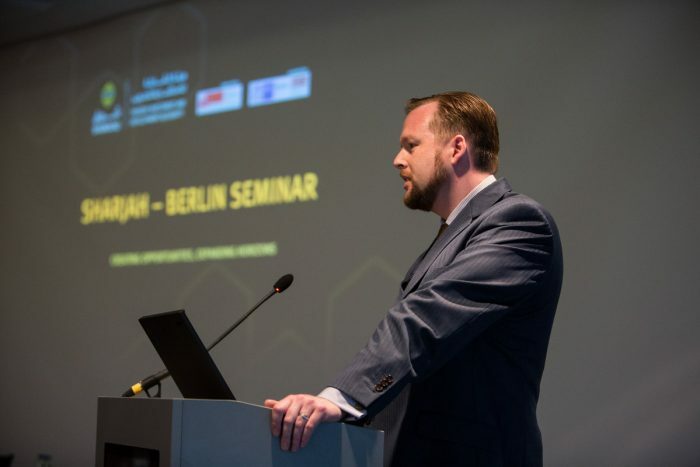 Sheikh Fahim bin Sultan Al Qasimi, Chairman of the Department of Government Relations in Sharjah, inaugurated the business seminar with his welcome speech, and expressed his belief in the fundamental role the Sharjah and German relationship is playing in strategically growing both their economies. “Relationships between Sharjah and Germany are built on 50-years’ worth of bilateral history. Both entities share a significant number of common values, which position this relationship as ideal and world-leading for both economies. These values include their investments in promoting cultural tourism and businesses that create cross-culture ecosystems. These strategies have assisted in elevating both country’s positions in global markets,” he said. “To-date, Sharjah attracts 40,000 German tourists, which reflects the emirate’s ability to provide international tourists with a unique and authentic experience on cultural, archaeological and ecological tourism. It also confirms Sharjah’s position in European markets as one of the Middle East’s most strategic and diversified tourism and investment destinations,” he added. He added: “Since our first visit to Germany in 2012, Sharjah Investment and Development Authority (Shurooq) has worked hard to further develop our economic ties. Last year, the Authority organised three business trips to Germany and managed through fruitful exchanges to significantly boost relations and take them to the next level of a strategic partnership. Today, there are more than 420 German companies and trade agencies in the emirate, 100 of which are based in Sharjah city and the rest in the emirate’s Free Zone Areas. Among these leading global companies are Daimler, Ferrostaal and Global Found Guise, with many smaller operations also well established in the emirate. The Shurooq CEO highlighted a number of German company success stories, revealing how they have made the most of the encouraging environment and the unlimited support and facilities offered by Sharjah to achieve significant growth and become major entities locally and internationally. Al Sarkal elaborated: "We look forward to attracting more German investors to setting up their businesses in Sharjah, as the emirate is one of the most promising areas for business growth in the Middle East. Sharjah is able to offer an unmatched investment-friendly environment in the region through its adoption of the principles of free trade and its clear vision for growth and development. Thanks to its encouraging legislative environment, the emirate is home to hundreds of foreign companies and to thousands of skilled workers." Dr. Stefan Franzke and Bjoern Hinrichs took to the floor to reiterate the strong business and cultural ties that Sharjah and Germany enjoy, the business-friendly environment which Sharjah has maintained thanks to its 100% ownership policy for foreign investors across its free zones, a promising competitive business ecosystem, feasibility of fund-transfer processes, practical logistics services, tax-free services and more, with both highlighting examples of successful German-Sharjah partnerships and expressing their view that there were many more such achievements to come. 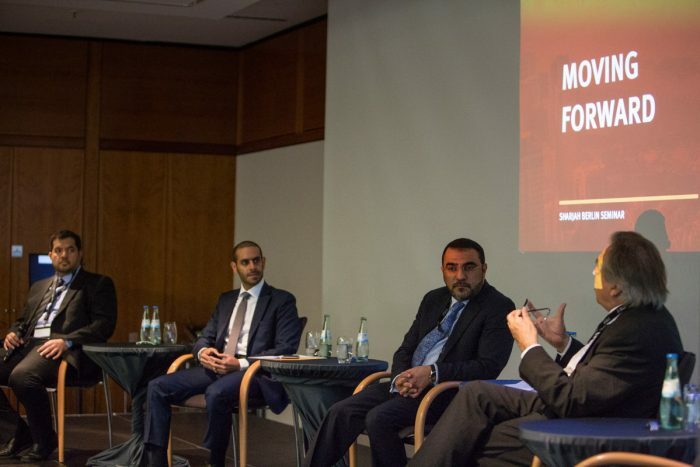 A major component of the Sharjah-Berlin Seminar was a session held as to discuss specific investment opportunities in Sharjah, which the discussion involving the participation of H.E. Marwan bin Jassim Al Sarkal, H.E. Hussein Al Mahmoudi, CEO of the American University of Sharjah (AUS) Enterprises and Fahad Ali Shehail, Chief Development Officer at Bee’ah. Moderated by Peter Göpfrich, former CEO of the German-Emirati joint Council for Industry and Commerce, the session attendees highlighted the rewarding partnership opportunities for German companies and investors in various promising sectors in the emirate; such as tourism, hospitality, leisure, transport and logistics, environment and education. They emphasised the economic benefits of investment in both the medium and long term. “The emirate of Sharjah has numerous business opportunities, tourist attractions and offerings that make it a unique investment destination. Sharjah Investment and Development Authority (Shurooq) continues to act as one of the major drivers in Sharjah’s economic growth and has succeeded in adding a portfolio of major tourist destinations and mixed-use development projects that have left an impressive imprint on the local tourist landscape. With its innovative eco-tourism projects, Sharjah Investment and Development Authority (Shurooq) has added even more momentum to the emirate’s fast growing economy, attracting investments worth millions of dollars. We look forward to establishing even more strategic partnerships with German investors and companies that have a wealth of business experience. This will be of significant mutual benefit as it will both enable Sharjah to achieve the next phase of its sustainable development and will provide the companies with rewarding returns generated from setting up their operations in the emirate,” said Al Sarkal. Speaking about investment in education, Hussein Al Mahmoudi, CEO of the American University of Sharjah (AUS) Enterprises, highlighted the business opportunities and investments that German education organisations and companies can leverage from the education sector in Sharjah. He underlined the importance of exchanging expertise between the two parties and forging partnerships to speed up the pace of economic growth and achieve high revenues in both countries. “The participation of the AUS Enterprise at the seminar is in-line with Sharjah’s commitment to transform its economy into a knowledge-based economy, which calls for innovation, research, science, and technology to be the key pillars of the national economy. Our goal is to familiarise German investors with our corporate initiatives, as well as acquire strategic German business associations that can contribute to Sharjah’s education sector,” said Al Mahmoudi. 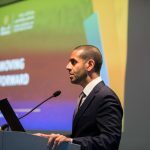 Speaking on the diversified technologies behind Sharjah’s waste management systems, Fahad Ali Shehail, Chief Development Officer at Bee’ah, highlighted the outstanding investment opportunities available in the emirate’s environment and waste recycling industry, drawing attention to Germany’s expertise in this area. 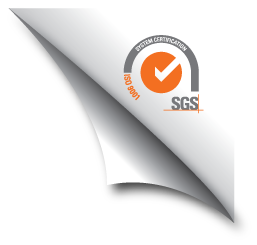 “Germany is renowned for its high quality industries and its sophisticated industrial technology. 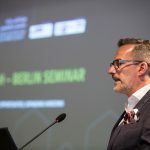 There are many German companies operating in the field of recycling and waste management industry which have attained a globally-acclaimed reputation. Among these are TM Recycling, ALBA Group and H & G,” he said. “I believe we are able to work together in order to bring about a quantum leap in the recycling and waste management field at the local level in Sharjah. 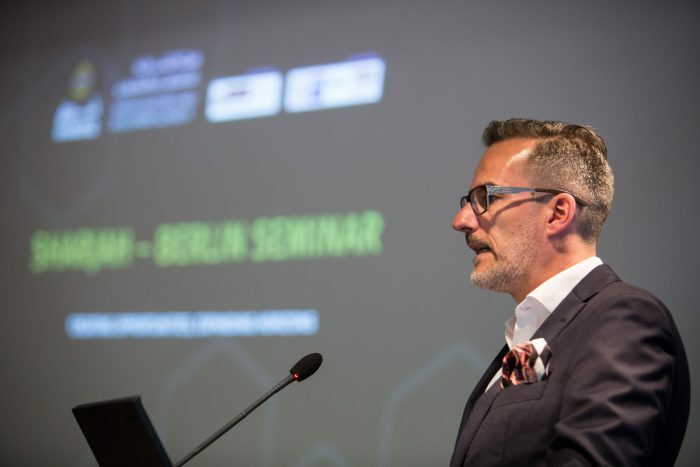 My hope is that Bee’ah can enter into partnerships with German investors to help fulfill its desired twin strategic goals of reaching Zero Waste to landfill and achieving 100% recycling,” he added. 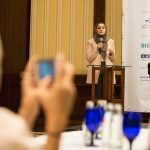 The Sharjah-Berlin Seminar was concluded with a range of meetings with representatives of a number of German companies interested in investing in Sharjah, with the discussions looking at ways to facilitate procedures for launching their businesses in the emirate and provide them will all support required. 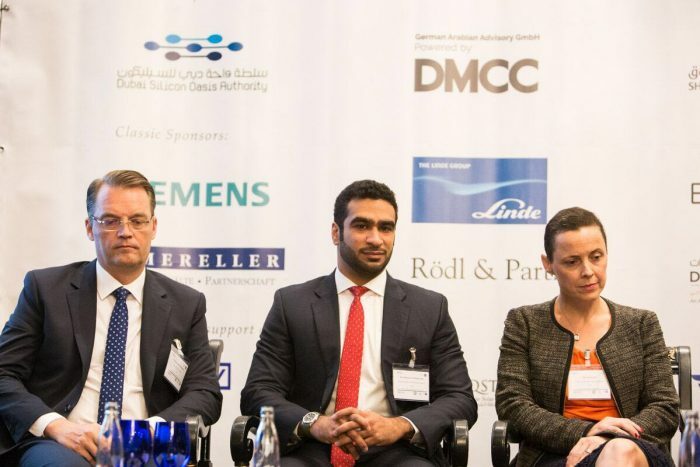 The following day, May 26, saw Sharjah Investment and Development Authority (Shurooq) participating in the 19th Arab-German Business Forum, organised by the German-Arab Chamber of Industry and Commerce (AHK). 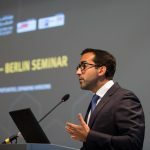 The forum, one of the most important economic events that binds the Arab world with Germany, invites decision makers, industry leaders and experts from both sides to discuss ways to boost and broaden Arab-German economic relations. 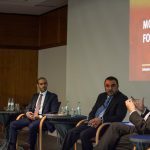 The forum was held as the Arab-German economic ties are witnessing further growth in the areas of investment and trade. 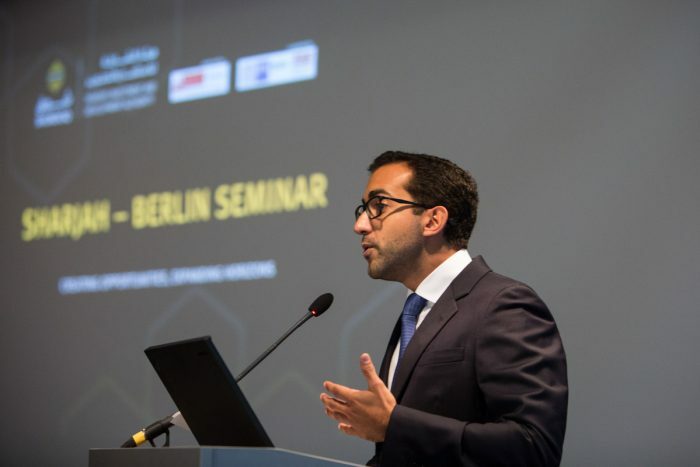 The volume of trade between Arab countries and Germany touched 50 billion euros in 2014, while Arab investments in Germany have expanded impressively in many major German companies and medium-sized enterprises. During the forum, Mohammed Al Musharrakh, Head of Investment Promotion at Sharjah Investment and Development Authority (Shurooq), gave a detailed presentation highlighting the advantages of investment in Sharjah and outlining the emirate’s 4 key sectors for investment growth: Tourism, Environment, Healthcare and Logistics and Transportation. He spoke about the major role that Sharjah plays as a business gateway to Asian, Australian and African markets, thereby connecting east and west. "Sharjah is one of the most attractive cities in the Gulf region and the Middle East for investors because of its rich assets, diverse and resilient economy, business-friendly legislative environment and its strategic geographical location that is close to global markets. The emirate also prides itself on its low public debt for its GDP. It is home to numerous free zones that facilitate business practice and simplify procedures for setting up companies. 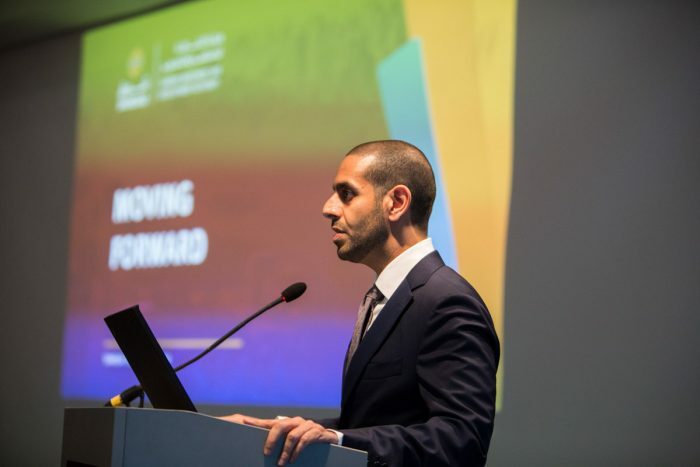 Because of all this, the emirate’s promising sectors, namely eco-development, healthcare, transport and logistics and leisure and tourism are considered the main areas of significant growth that can enable investors to achieve good profits,” said Al Musharrakh. 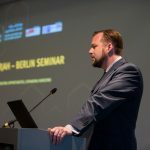 “We aim through our participation in this forum to introduce German investors to Sharjah’s business-friendly environment and its unique assets, attract German capital and investors looking for stability and rewarding returns. The emirate offers an open environment characterised by safety and transparency for foreign investments and is also a platform for these companies to expand their businesses into other countries in the region,” he continued. Eng. Khawla Al Hashimi, Head of the Design Section at Sharjah Investment and Development Authority (Shurooq), gave a presentation outlining the positive impacts on Sharjah’s real estate sector of the tourist destinations and projects launched by the Authority. She highlighted how these were designed to be in harmony with their surrounding environment, thereby forming unique architectural masterpieces. She explained that these developments have helped attract more capital investment to the emirate and achieved added value to both investors and the emirate’s economy. “Shurooq’s tourist and leisure destinations and projects have helped drive the emirate’s other economic sectors. In addition to ensuring that these projects are modern and technologically advanced, Shurooq has ensured that the design of these projects is in harmony with the local culture and the natural and authentic surroundings. This is done without prejudice to the unique architectural components of the local environment, especially for our projects located within the emirate’s historical areas and in its areas of outstanding natural beauty,” she said. “Al Bait Hotel, which is currently being developed by Sharjah Investment and Development Authority (Shurooq) in the Heart of Sharjah, stands as an obvious example of the strategy embraced by the Authority in developing projects while maintaining the integrity of their natural surroundings. The project aims to preserve most of the old houses in the area, which was selected exclusively for the construction of the hotel and its components. Another good example is Al Khan Village, with Sharjah Investment and Development Authority (Shurooq) ensuring that extra care is being given to protect the historical cultural heritage that distinguishes the Al Khan old area. Sharjah Investment and Development Authority (Shurooq) is giving special attention and care to ancient houses made from local raw materials, such as palm trunks and coral, making the project a very attractive heritage destination in the emirate,” she added. Al Hashimi went on to say: ‘This sustainable model of development attracts a special type of investor who attaches a high degree of significance to such considerations. 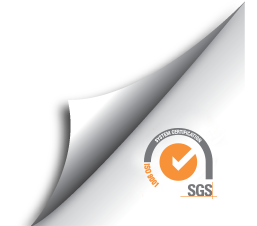 It gives more value and confidence to our projects generally and provides d more promising investment options that constitute important attractions for German companies and businessmen."